FREE Trim & Ton Gel! Cellulite is the changes in skin texture that result in an "orange peel" appearance to the skin. Cellulite is much more common in women. Studies show 85-98% of women have some cellulite. Men and women organize their fat differently. 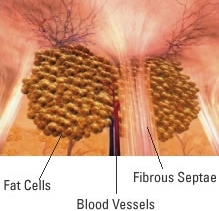 In men, the connective tissue fibers that organize and support fat run primarily parallel to the skin. This means that men have minimal pulling down of the skin by fat deposits, and therefore smoother skin. Unfortunately for women, their fat is organized perpendicular to the skin. This results in a pulling down of the skin by the connective tissue support structure and an uneven surface. Cellulite is a normal process in women, so for many years medical science was not interested in treating it. Only in the last few years have any studies been done to identify the cause of cellulite. Effective treatments are an even more recent development. Cellulite forms in the superficial fat. 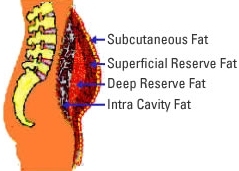 All fat is not cellulite, only the part present in this superficial layer. The superficial layer is the last area to be affected by weight loss. Therefore, exercise and weight loss do not eliminate cellulite. Even women who exercise regularly and follow low-fat, nutritious diets may still have cellulite. This makes weight management and cellulite treatment completely different issues. Until recently, very few studies had looked at the cause of cellulite. As a result, theories abounded but answers were few. Recent studies have revealed two major causes of cellulite. The first is a hardening of the connective tissue support system of fat. These are referred to as connective tissue (fibrous) septae. These are made of collagen. Over time, these septae harden and contract. The contraction results in most of the dimpled appearance that characterizes cellulite. Additionally, the contraction leads to a blockage of the blood vessels and lymphatics. The blood vessel blockage further hardens the septae. The lymphatic blockage leads to thick, swollen appearing skin. The second major cause of cellulite is protrusion of fat cells into the lower part of the skin known as the “reticular dermis”. This protrusion results in worsening of the dimpling. Treatments for cellulite need to address both of these issues in order to have really good results. Until recently, no treatments were available to address either issue effectively, much less both. Cellulite is a problem that primarily affects women; even women who are not overweight and who keep fit and healthy suffer from it. Although obesity does not cause dimpling, it does become more obvious with weight gain. More than 80 percent of women have some degree of cellulite. Acoustic Wave (AW) represents a new approach to cellulite treatment. AW uses pressure waves that impact both of the major causes of cellulite: fibrous septae and protrusion of fat into the lower dermis. The AW produces a pressure wave that passes through skin and fat to impact the fibrous septae. The pressure breaks up the collagen of the septae and releases the skin, allowing a smoother surface.